PortSide NewYork’s 2019 Black History Month program about African American Maritime History (#AfAmMH) is all digital since we have no building space for public programs. We will be posting to our Facebook pages, Twitter and Instagram and updating this blogpost with content over the month. Please send us ideas, comment and share. The MARY turns 80! PortSide turns 13! Our ship MARY A. WHALEN made history! She turns 80 on May 21, 2018, and you can visit for art-making and TankerTours on Sunday May 20. She is the only oil tanker in the world open for public culture, education and job-training programs! Come visit! Come get to know PortSide NewYork! We turn 13 this month! Cash bar with beer, wine and imported sodas. BYO food or order in from great local venues. Menus will be on hand. Buy tickets on Eventbrite here. 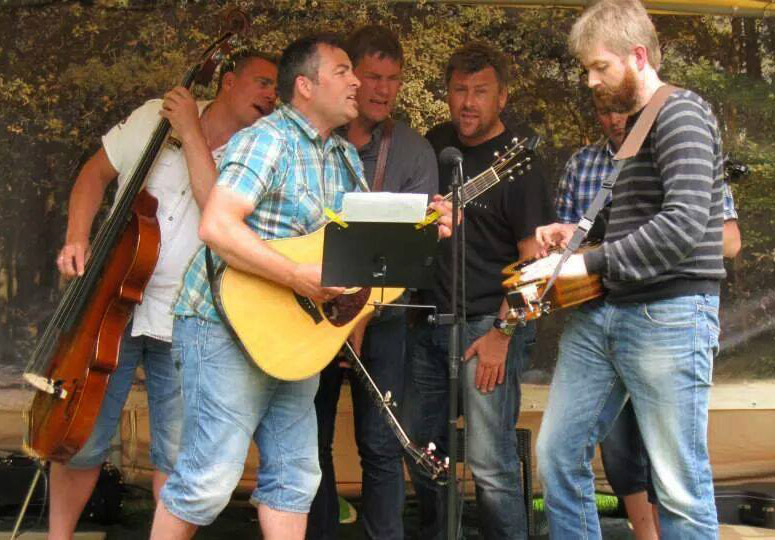 Come nestle in a sofa or dance into the night with great bluegrass music during the NYC premiere of the band Paradise Mountain Boys from Norway - and get yourself a NY WaterStory! Produced by PortSide NewYork as part of our ongoing Red Hook WaterStories. You will be surrounded by projections of vintage film and photos on the brick walls as you soak up the maritime history of Norwegians in Red Hook. 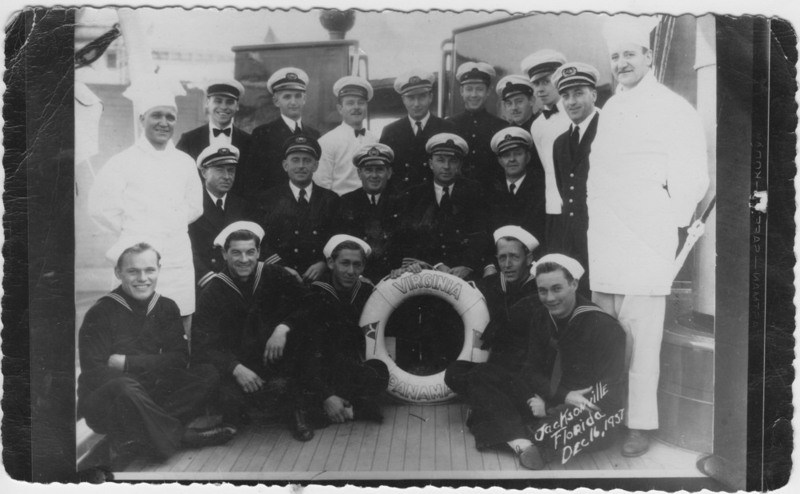 Norwegians were one of the major immigrant groups in Brooklyn from the late 19th to early 20th century. They were a major presence on NYC's working waterfront and on historic ship, the tanker MARY A. WHALEN. They were first concentrated in Red Hook, Brooklyn. This is the NYC premier of the Paradise Mountain Boys! The band plays the traditional way with all the band members around one microphone. Their six-piece acoustic outfit of mandolin, dobro, banjo, guitar and upright bass has its roots firmly planted in down-home acoustic music found in the Appalachian mountains. Traditional bluegrass and bluegrass gospel, with beautiful harmony singing is their thing. The evening kicks off with speakers covering various aspects of the Norwegian New Yorker experience, then the NYC premier of the Paradise Mountain Boys, a bluegrass band from Norway! Contribute your own WaterStory at our StoryStation. Peruse paper and digital Norwegian New Yorker history at our ReadingTable. 9:45-10:30pm time to talk to the historians and band, read history at our ReadingTable, get interviewed at our WaterStories StoryStation, sign up to be interviewed in the future. Victor Samuelsen will talk about the first people to row across the Atlantic, two Norwegians George Harbo & Frank Samuelsen who did that in an open boat - in 1896! PortSide NewYork board member John Weaver will talk about his father in law Alf Dyrland who left Norway as a cabin boy at age 13 and was captain of our ship MARY A. WHALEN from 1958 to 1978, one of many Norwegians to work on the MARY and for the two companies for which the MARY worked most of her years, Ira S. Bushey & Sons in Red Hook and Ekloff in Staten Island. The 1931 silent film “Glimpses of Old New York” playing on the walls is by Engineer Michael Leirvik, shot to show Norwegians how their emigrants brethren lived in NYC and especially Brooklyn, courtesy of Norsk Film Institut, Oslo, with the permission of the Leirvik Family. Profuse thanks to the Paradise Mountain Boys for donating this concert. This is another “Artists for PortSide” event where artists donate their work to PortSide NewYork. Thanks for funding support from Councilman Carlos Menchaca and for tech support from Hughes Media Group and Pioneer Works and venue Atelier Roquette. The venue Atelier Roquette was generously donated by the dynamic duo Monica Byrne and Leisah Swenson, the force behind three businesses, Atelier Roquette, home/made and Roquette Catering whose flair has converted a former forge, ice cream warehouse and espresso machine repair shop into Atelier Roquette, a cozy, airy nest for brunch, weddings and community events. The esthetic here is an exquisite balancing of flowers and rust, linen and stainless with notes of rustic wood with an eclectic mix of chairs, tables and lounge spaces. Check out the interior courtyard with blooming oranges and roses! 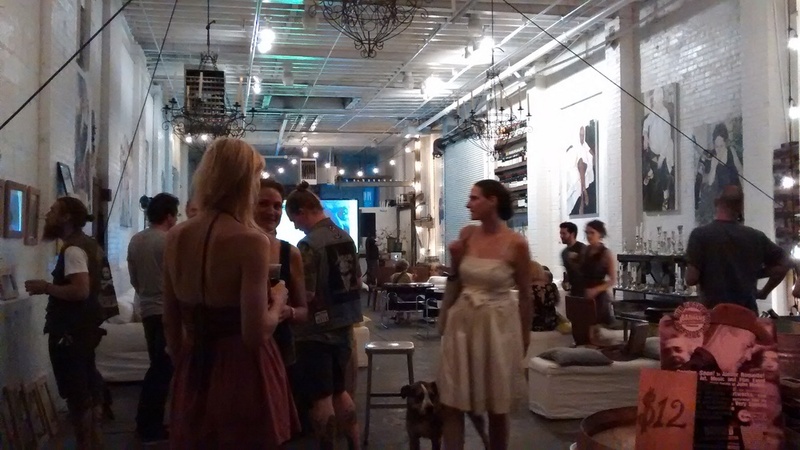 Proceeds and donations from the evening support future Red Hook WaterStories programs. This event is part of PortSide NewYork’s ongoing Red Hook WaterStories project which tells the history of the Red Hook peninsula along a water theme, including early Dutch tidal mills, shipyards and ports, nature, real estate development, squatters, illness, crime, harbor connections to unexpected things, and contemporary maritime activities ashore and visible from our shore. It tells of Red Hook’s greatness: when the port of Brooklyn was a place of international importance, and the best in the region from the mid-1800’s until the mid 1900’s, its heart was in Red Hook. From this content, PortSide makes school programs, public programs, digital and paper Red Hook maps and guides, and the research also informs our advocacy and neighborhood promotion work. Help us keep up the momentum! To support PortSide NewYork programs and to get involved with our efforts, please donate, volunteer, attend our October 27 fundaiser at Hometown BarBQue, and/or see www.portsidenewyork.org for how to contact us. Yesterday, Don Horton visited PortSide NewYork to give us some oral history. PortSide has been corresponding with Don Horton since October 2013, and the last time Don Horton visited Red Hook was 1950. Starting in the 1940s, through the WWII period, he was working as a child in the merchant marine - a paid worker - so the company knew what was going on. Yes, such a class of merchant mariner existed, and Don has dedicated his retirement years to getting their service recognized by the federal government, along with the women, elderly and disabled who worked in the wartime merchant marine. All of that being a startling case of "who knew?" We wrote about his dogged efforts to reveal this hidden history in a prior blogpost. Don knows conventional military service, what it is to be a vet. He served in the Korean War, and he believes that the hundreds of thousands of merchant mariners who served during WWII deserve our nation’s acknowledgement of their service whether they were towing supplies to the European theater or moving cargo along our eastern shore where German U-boats came in close to sink their kind of vessels. From age 10-18, Don Horton worked on barges, along with his two brothers, his sister, and his mother, all of them joining the father of the family throughout the summer. One of their main jobs was hauling coal from Norfolk, Virginia up north. The two boys learned fast how to repair a steam boiler, and they painted the barge. Mama (Sadie Horton) was the cook. The sister married early in the story and got off the boats. Papa seems to have liked drink too much, and brother Billy got off the barges to get away from that and went to work on a tug. The third day on the tug, at age 17, Billy was killed when Germans shelled and sank his boat. In comparison, Don’s memories of Red Hook are more associated with fun. A stop in New York meant good times. Don recalled a trip to 42nd Street and the treat of a hot dog. A trip to Coney Island netted a very big hot dog. Yesterday, Don was in town to see some Senators on behalf of his cause which you can follow on Facebook and to contribute some oral history to PortSide's WaterStories cultural tourism effort. Here is a preliminary glimpse of some gems we got from Don today. Carolina Salguero, John Weaver and Peter Rothenberg spent several hours interviewing Don and recording video and sound files. Don's tack-sharp memory and vivid story telling made for a great afternoon. We started out talking over lunch in the galley of our Mary A. Whalen with Don and his darling wife Norita. After lunch, we visited the site of Ralston's, a grocery store during WWII Red Hook: fruit under an awning out front, narrow aisles and a place where they preferred you give them a list of what you wanted instead of getting it from the shelf yourself, little shopping carts with wooden wheels. 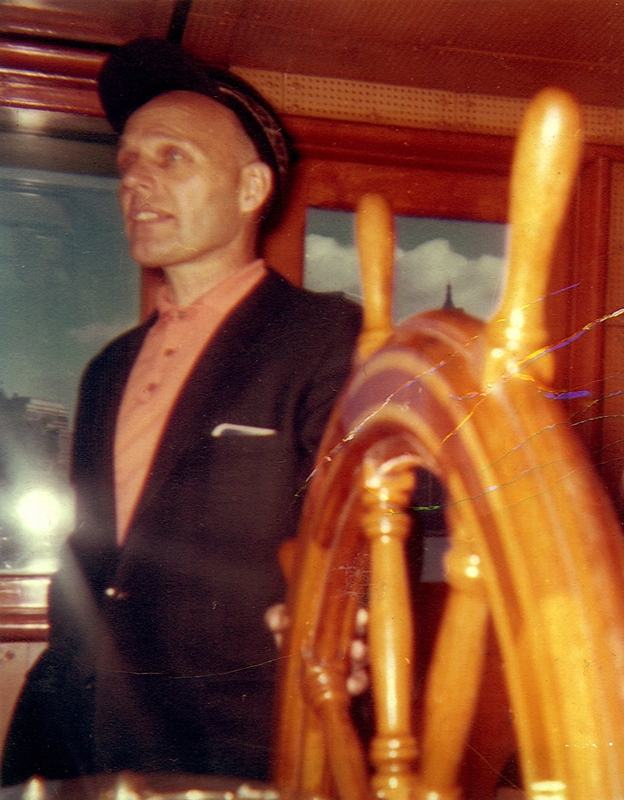 Don said boats liked to provision at Ralston’s and explained the allure: the captain's were given free liquor in the back in a private bar which ensured they would frequent the joint and then spend grub money in the store. Ralston’s address was 294 Van Brunt Street, now BAKED. Don said that the soda Spur was their favorite and that he and his siblings fought over the precious bottles on the barge trip to the next port, the ice blocks from Ralston's being their only refrigeration until they got there. Here is a 1943 ad for Spur, "a cola with a walnut taste," he remembered with a smile. Next, we took Don Horton past two once-twin tenements, one of which is at 415 Van Brunt, to see if those were the kind of buildings that matched his "never would happen now" WWII memories of a Van Brunt Street where women on hands and knees scrubbed little porches with buckets of water, a scrub brush and a big bar of Octagon soap. YES, those were the kinds of buildings he remembered! Don then explained that "doing laundry" on the barge was scrubbing dungarees on the wide rail of the barge and leaving them to dry there. From there, over to Sunny's Bar where we were thrilled to find Sunny himself lounging in bathrobe with friends at the end of lunch. At age 80, Sunny is but 2 years younger than Don, and they shared many memories including swimming in the filthy water of the time which both cited as having lots of turds and Coney Island whitefish as Sunny called them, or rubbers in Don’s version. Sunny cheekily got an old load off his conscience when he confessed that he'd "borrowed' someone's rowboat at one point, and on top of that lied to his Papa saying that he had not taken it, and apologized to Don who said they'd come back from Ralston's Grocery at times to find their boat gone. The rowboats always came back, Don said, but delays were a big concern; because if they missed the tide, the current would be too strong to row against it in their little boat loaded with groceries. Sunny shared memories of how, when he heard wartime air raid siren drills and knew that the war was being fought "overseas," thought that Staten Island (which was overseas for a little Red Hook boy) was under attack. Don Horton gave us several copies of this book. Here is what Don told us about shelling during the interview in the galley: When he first started on the barges and saw flashes of light when they were offshore and asked Papa what they were, Papa fibbed and didn’t say it was German’s shelling the American merchant marine, he said it was lighting. Later on, “I knew what those lights were,” said Don, “and something I don’t often say, I wet myself with fear.” The barges were old boats, unarmored with no weapons, three miles behind the tug, he clarified. "Barge" of the sort Don Horton and his family work, dismasted wood schooner hulls. We need to clarify what "barges" means here. These were the old, creaky hulls of wooden schooners, dismasted to turn them into barges. Don said the vessels' intended life span was some 25 years and these were 50-60 years old and so frail that after being beat up in a storm, the caulk might be battered out. Then, they'd have to go to a shipyard for repairs. We walked out to the end of the Beard Street Pier so Don Horton could see the Red Hook flats and the entrance to Erie Basin. This prompted more memories. Don had emailed us some great memories of the Red Hook flats last year which paint a picture of a harbor jammed with ships, tugs, barges, row boats and the "bum boat" or "speculator" a sort of scrap dealer and rag picker afloat who went from vessel to vessel buying what he could. Yesterday, Don described how he and his brother scavenged whatever they could, lengths of tired rope, bits of metal they found or “liberated” from cargo on the occasions they were hauling metal. "There's the cut," Don Horton said as soon as he saw the entrance to Erie Basin. Standing on the end of Greg O’Connell’s Beard Street Pier enabled Don to pin point geography in a way that looking at the map while seated in our galley had not, and he explained that the dinghy dock location was around the Erie Basin side of that pier. During WWII, tugboats were jammed into the place where the New York Water Taxi homeport dock is today. PortSide recently acquired this page from an old magazine showing a view of the Erie Basin during the era described in this interview. Don said there were often up to 50 barges at anchor "on the Red Hook flats" as he called them, and that Erie Basin was so chock full of ships and barges that his family had to find channels underneath the bow and stern rakes of the barges to row their way through the fleet. 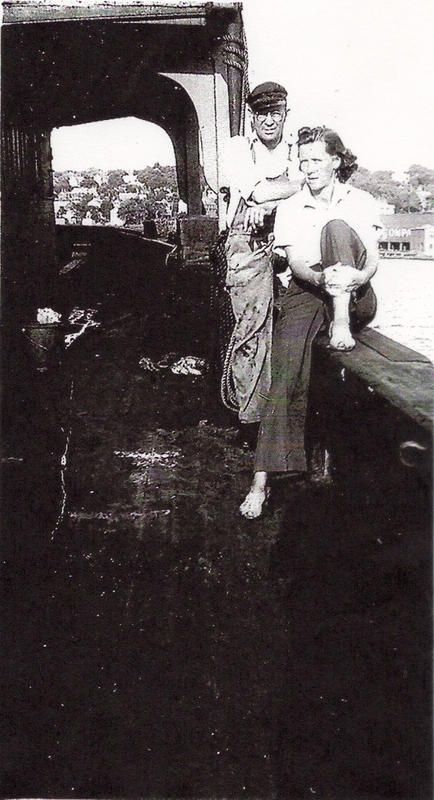 During the interview in the Mary A Whalen galley, Don described how his father bought a lot of whiskey when he was ashore, and his mother would dump it over the side once they got back to the barge on the Red Hook flats, to the point that she said the flats must be full of whiskey bottles. Hello, bottle collecting divers! We were all surprised to learn that Don's mother did not know how to swim and was afraid of the water but still spent every summer working the coastwise barges with her husband and children during the war. The whole endeavor required a lot of courage by everyone in the family, and PortSide NewYork is helping to get this aspect of history, that's national history and local history, better known.